Modern geometric pendant with rubbed oil bronze finish. Perfect focal point for any space. Matching canopy included. The E12 bulb base gives you a very broad choice in bulb styles to choose from. Contemporary pendant with a rubbed oil bronze finish. Perfect focal point for any space. Matching canopy included. The E12 bulb base gives you a very broad choice in bulb styles to choose from. The SLOAN pendant in chrome with plated glass housing and shimmering crystal droplets is a show stopper. Contemporary in style yet classic timeless elegance. Looks great over an island, on its own or in clusters. Perfect for the kitchen. Introducing the Savannah Collection. Unique strands of crystal and warm stones cascade from an antique hand finished antique bronze frame. This pendant will be a great addition to any room in the home or office. 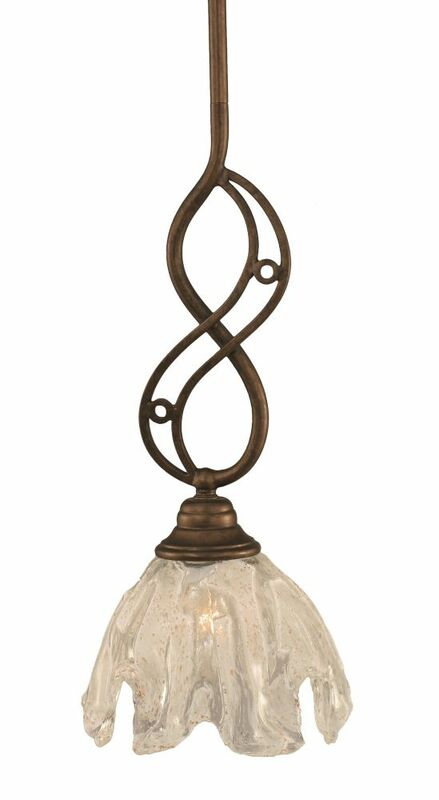 Concord 1-Light Ceiling Bronze Pendant with a Clear Crystal Glass The cornerstone of the concord Collection is quality, and this pendant is no exception. Combining a classic bronze finish and posh styling, you will find no better way to highlight the charm of your home. With the superb craftsmanship and affordable price this fixture is sure to tastefully indulge your extravagant side.